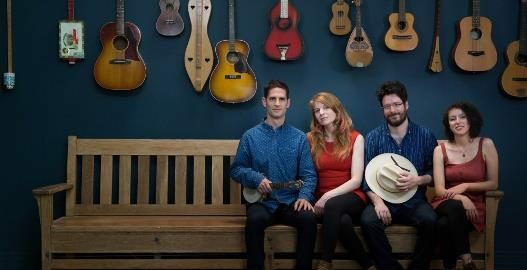 We are very proud to present this fine group of musicians, Jayme Stone and Folklife, who explore the deep roots music of North America and beyond. They have a new album and a new show to share as follow-up to their earlier tour and album called the Lomax Project, which was performed here at Caltech three years ago. They are touring the country, winding up in New York’s Carnegie Hall in June. Jayme Stone is a Canadian banjo innovator, known for his bringing together diverse music, be it Bach or from Africa. His range is tremendous and his knowledge of the music insures that it will be an authentic rendering. Jayme has won a pair Juno Awards (the Canadian Grammy), three Canadian Folk Music Awards; and has been featured on NPR, BBC, and the Canadian Broadcast Corporation, and he has performed thousands of concerts at places like the Lincoln and Kennedy Centers, and many others around the world. The program treats old field recordings from the Library of Congress not as time capsules, but as heirloom seeds passed down from a bygone generation. Planting these sturdy seeds in modern soil, this versatile gathering of musicians- Jayme, Moira Smiley, Sumaia Jackson & Joe Phillips– has cultivated vibrant Sea Island spirituals, Creole calypsos, and stomp-down Appalachian dance tunes for contemporary listeners. Moira, now living in Vermont, is familiar to many from her previous appearances at Caltech with her group, VOCO. She is also known for her parts in feature films, BBC & PBS television programs, NPR, and her part on more than 60 albums. Noted for her gorgeous voice, she is known for her compositions, singing and song leading, which has also been featured in appearances with the Los Angeles Master Chorale. Sumaia, from the Bay Area, was classically trained in violin early on, and then went to Berklee College of Music in the American Roots Music department, and she sought out roots communities, including Scottish, Appalachian, Bluegrass, and Jazz. She can often be found at fiddle camps, and she plays in several ensembles besides Folklife. Joe, born and raised in Toronto, is also classically trained on the double bass, and is equally comfortable playing with orchestras, or in bars and pubs with a host of performers. Focusing on songs collected from field recordings at the Library of Congress, this ensemble preserves the essence of these fine recordings, while polishing them just a bit with contemporary nuances. Their recording based on this project, Jayme Stone’s Folklife, was nominated for a Juno Award (Canada’s Grammy equivalent) in the Traditional Roots Album of the Year category in 2018.